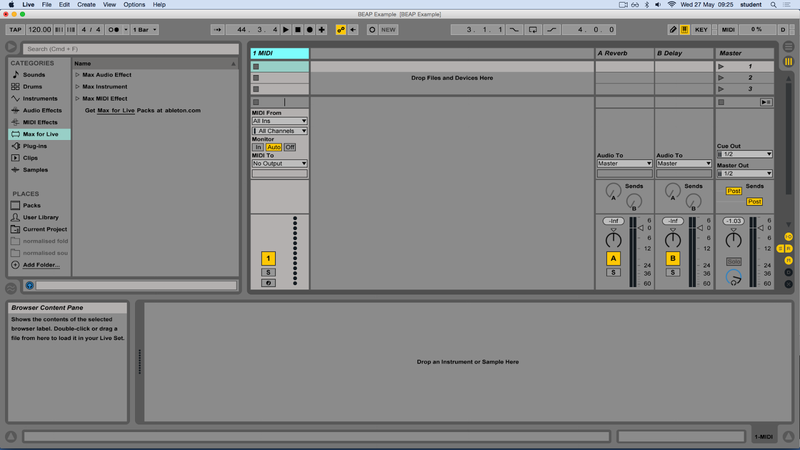 This post covers the basics of using Beap with Max for Live and Ableton Live. 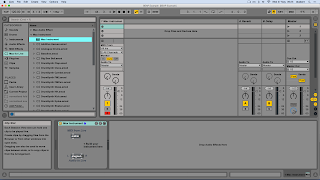 Max for Live is a bridge between Ableton Live andCycling 74's Max. 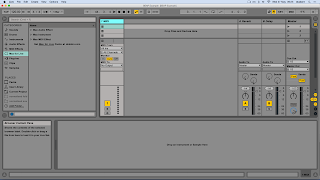 Max for Live allows for the creation of user-generated content in terms of Instruments, MIDI effects and Audio effects in Live. 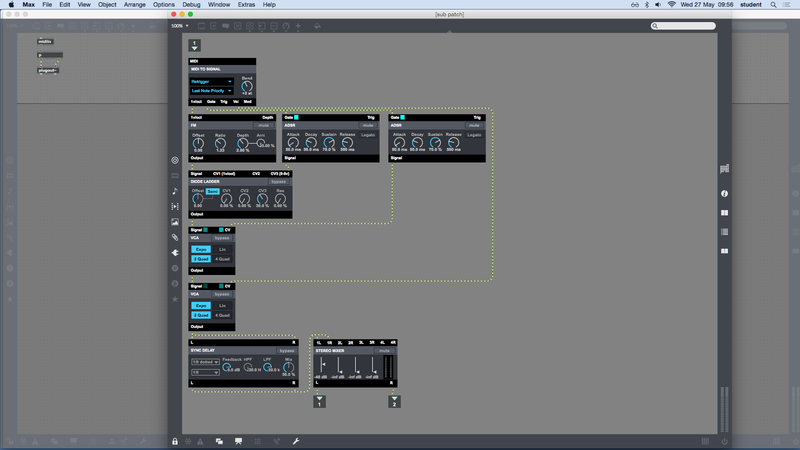 Beap is a set of modular devices / patches in Max by Stretta. 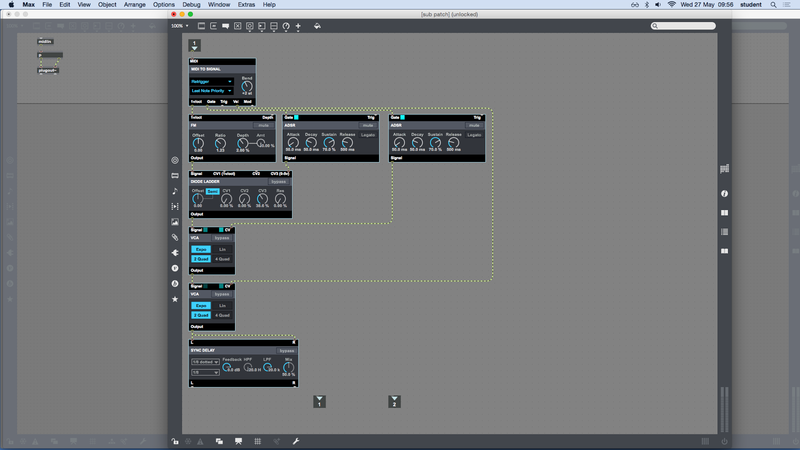 This tutorial will demonstrate how to build a simple FM synthesiser with MIDI control, a filter with ADSR and volume controlled by both ADSR and velocity. Let's start off with a blank, default Live set. 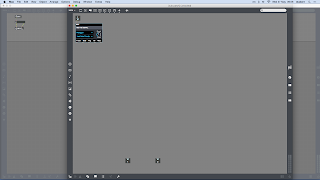 Delete the two audio tracks as well as one of the two MIDI tracks. 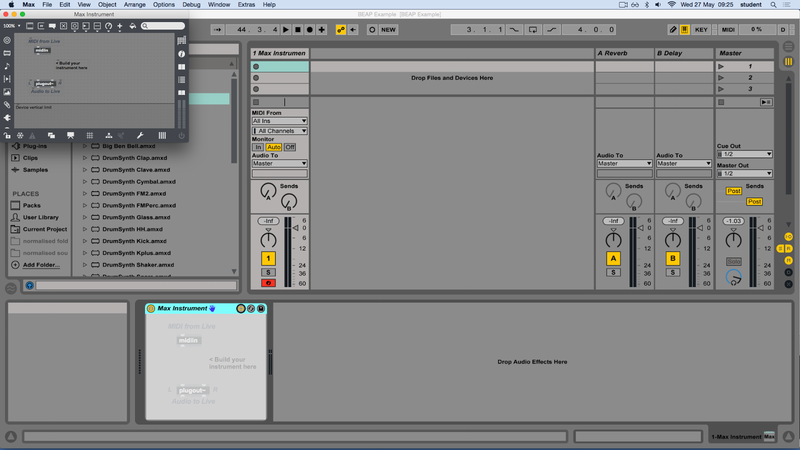 In the Live browser, go the the Max for Live category, and add the default Max Instrument device to the MIDI track. 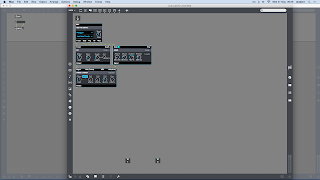 A Max Instrument takes MIDI data as an input and sends a left and right audio signal as an output. 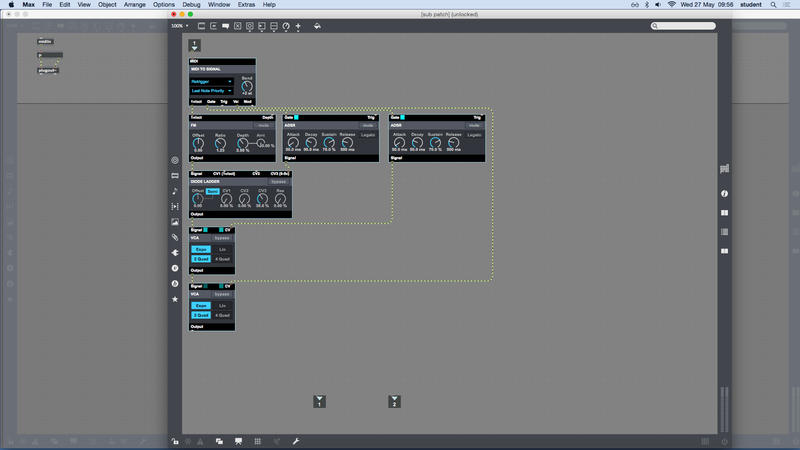 The instrument that is built will generate an audio signal that is based on the incoming MIDI data. Click on the edit button, which is the third on the right in the title bar of the Max Instrument device. 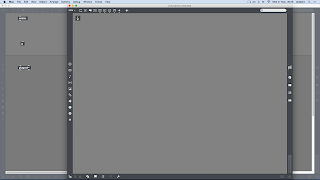 Assuming that Max 7 is installed, the Max environment will open up and the Max Instrument patch will be editable. 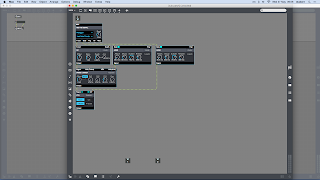 The midiin object represents the MIDI data coming into the device from the Live MIDI track or MIDI device. The plugout~ object represents audio going out of the device. The p object does not have any inputs or outputs; it is currently impossible to send MIDI data to the p object by connecting patch cables, or audio out of it. Inlets and outlets are required. 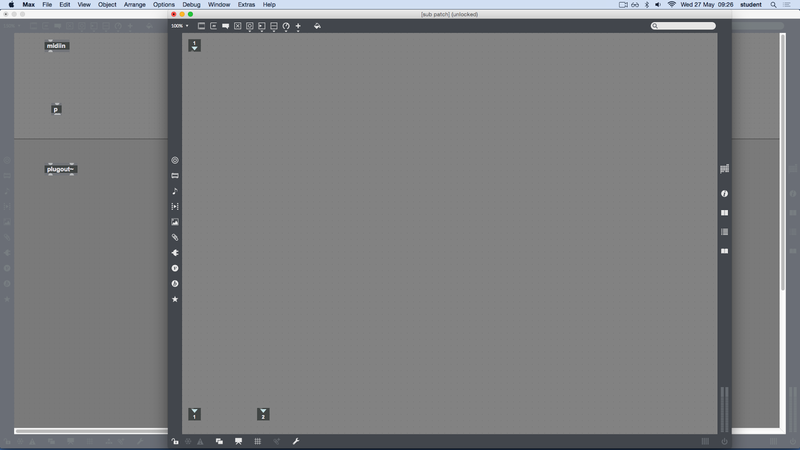 Create a new object by pressing the n key in the sub patch. Type in the word inlet, and hit return. The object will turn into a triangle that represents signals coming into the patch via an input going into the p object. This single inlet will represent MIDI data coming into the sub patch. 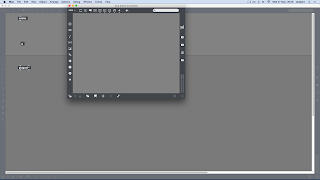 Create two outlet objects. These outlets represent the audio left and audio right signals coming out of the sub patch. 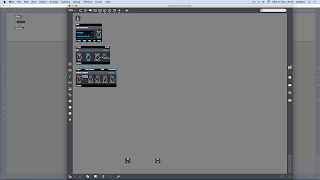 In order to make use of MIDI data with Beap devices, a method for converting MIDI data into CV signals, gate signals and trigger signals is required. 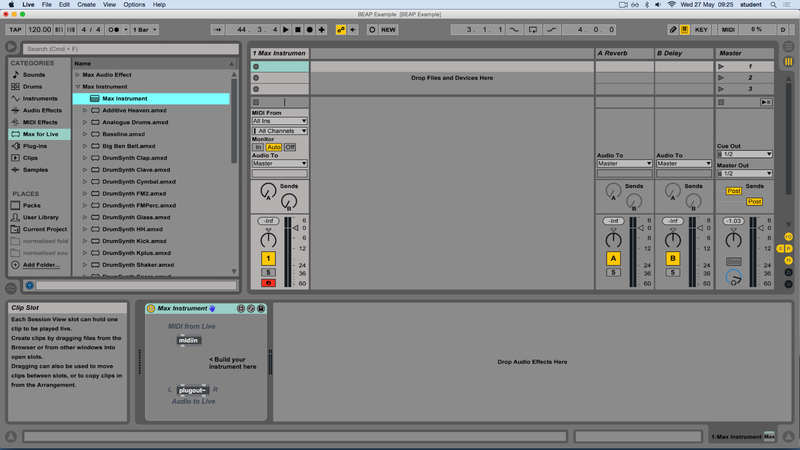 Go to Beap > MIDI > MIDI to Signal and double click to add a Beap MIDI to signal device. 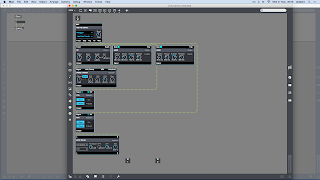 The MIDI to signal device takes MIDI data as an input, and outputs CV, gate and trigger signals. The 1v/oct signal outlet corresponds to the frequency of incoming notes. The Gate and Trig outlets indicate whether or not a note has been played, and how long the note is held for. The Vel outlet corresponds to a signal level for the velocity (which can thus be mapped to other elements within Beap) and the Mod outlet corresponds to changes in the modulation wheel data. For the purposes of this tutorial, only the 1v/oct, Gate and Vel outlets are used. Additionally, click back to the top level patcher, and connect the midiin object to the inlet of the p object, and two outlets of the p object to the inlets of the plugin~ object. Return to the inside of the p object once this has been done. Go to Beap > Oscillator > FM Oscillator and double click to add a Beap FM oscillator device. This is a basic single carrier / single modulator type FM oscillator with minimal settings of ratio and depth. The depth can be controlled via a CV signal. Connect the 1v/oct output of the MIDI to signal device to the 1v/oct input of the FM oscillator. 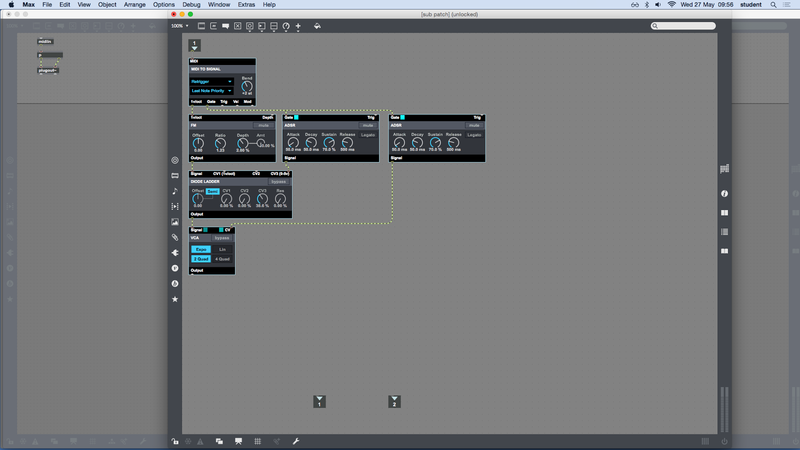 As a result, the frequency of the FM synthesiser will be controlled by incoming MIDI notes. Feel free to experiment with other oscillators, too! Go to Beap > Filter > Diode Ladder and double click to add a Beap diode ladder type filter device. 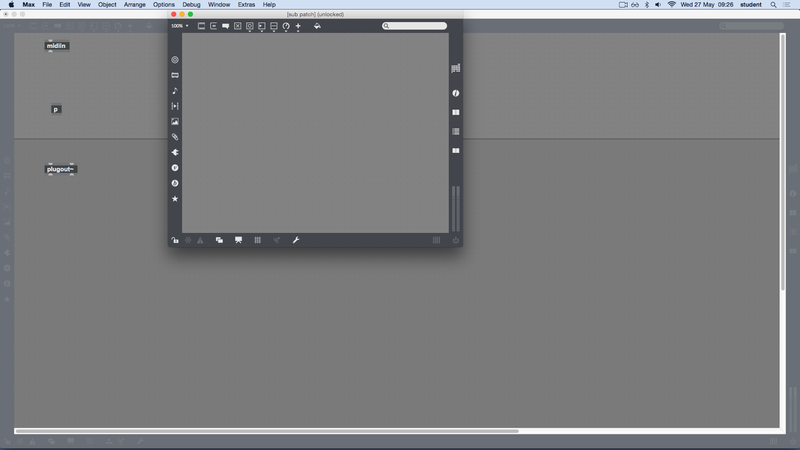 This is similar to the filter used in the previous tutorial, however with a somewhat harsher sound. Once again, there are three CV inputs, a signal input and a signal output. Go to Beap > Envelope > ADSR and double click to add an ADSR envelope generator device. This is the same ADSR envelope generator as used in the previous tutorial. Connect the gate outlet of the MIDI to signal device to the gate inlet of the ADSR device. Every time a new MIDI note is detected, a new ADSR envelope is generated. Connect the signal outlet of the ADSR envelope to the CV3 inlet of the diode ladder. The ADSR envelope will now control the frequency of the diode ladder, assuming that the CV3 percentage parameter is set to a value greater than 0%. Create a second ADSR envelope. 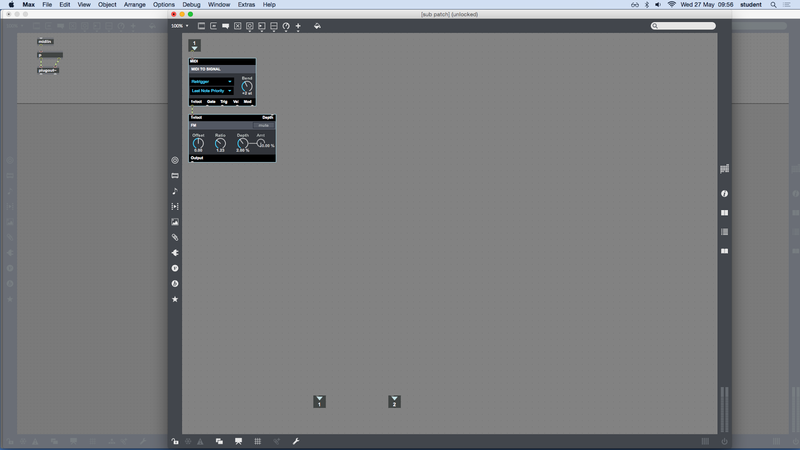 Go to Beap > Envelope > ADSR and double click to add an ADSR envelope generator device. This is the same ADSR envelope generator as used in the previous tutorial. Connect the gate outlet of the MIDI to signal device to the gate inlet of the ADSR device. 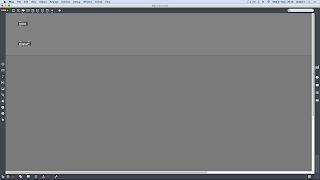 Every time a new MIDI note is detected, a new ADSR envelope is generated. This second ADSR device will be used to shape the volume of the signal. Go to Beap > Level > VCA and double click to add a VCA device. A VCA is a voltage controlled amplifier, whereby a signal can have the volume modulated by using a second signal or control voltage. A VCA has two inputs - a signal and a CV input - and one output - a signal output. The signal input is the signal that is to be modulated. The CV input is the control voltage signal that is to be used to control the volume modulation. Connect the signal output of the diode ladder to the signal input of the VCA. This is the audible signal. Connect the signal output of the second ADSR to the CV input of the VCA. This is the control signal used to change the volume of the audible signal. As a result, the ADSR will be used to control the volume of the synth for every note that is received. 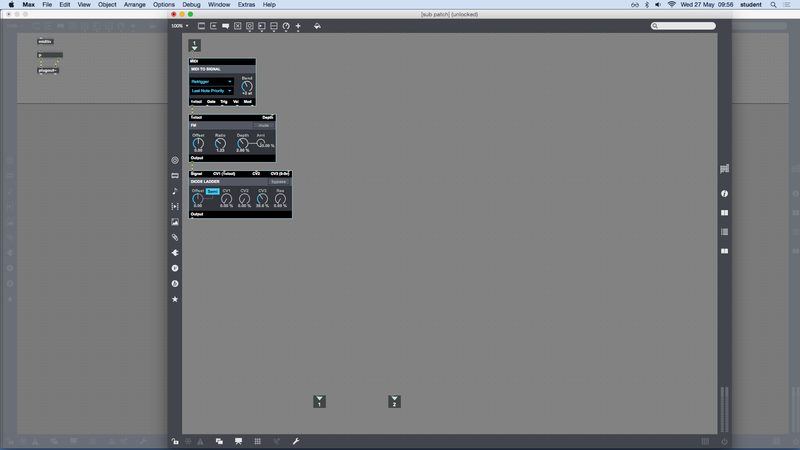 Create a second VCA. Go to Beap > Level > VCA and double click to add a VCA device. Connect the signal output of the first VCA to the signal input of the second VCA. This is the audible signal. 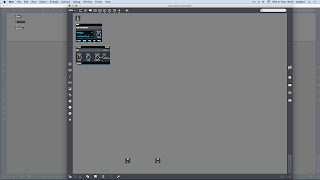 Connect the Vel output of the MIDI to signal device to the CV input of the second VCA. This is the control signal used to change the volume of the audible signal. 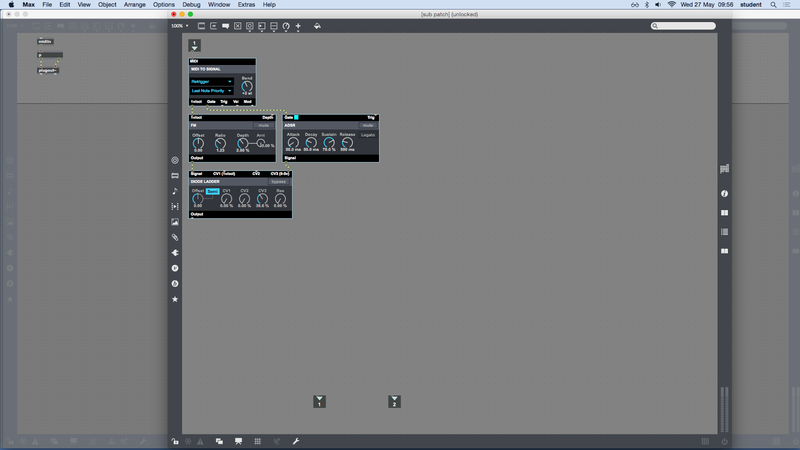 As a result, the velocity will be used to scale the volume of the synth. Go to Beap > Effects > Sync delay and double click to add a sync delay effect device. The sync delay device is a rhythmic subdivision-oriented delay with feedback and filters. Connect the signal output of the second VCA to the L and R inlets of the sync delay device. Go to Beap > Mixer > Stereo Mixer and double click to add a stereo mixer device. 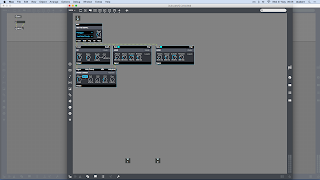 The stereo mixer device can take up to four stereo (left and right) audio signals, and mix them down to one stereo (left and right) audio signal. Connect the left and right outlets of the sync delay to the left and right inlets of the stereo mixer. Connect the outlets of the stereo mixer to the two outlet objects inside of the p object. Return to Live, and the changes made to the Max instrument device will be reflected. 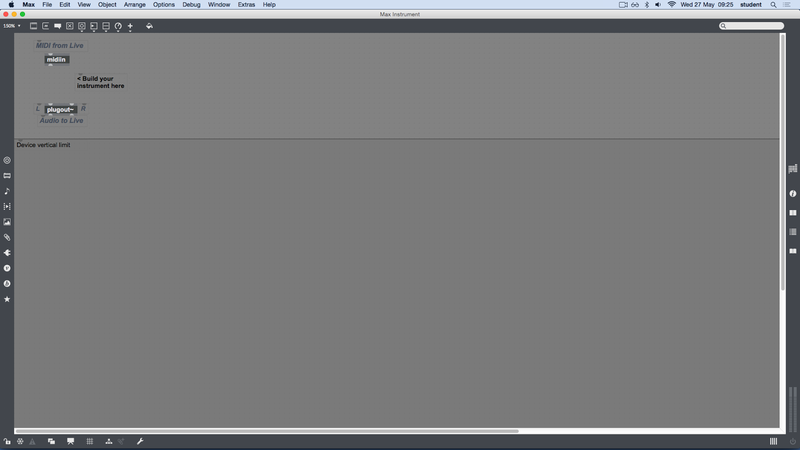 Within Live, open up the p object by double clicking on it. 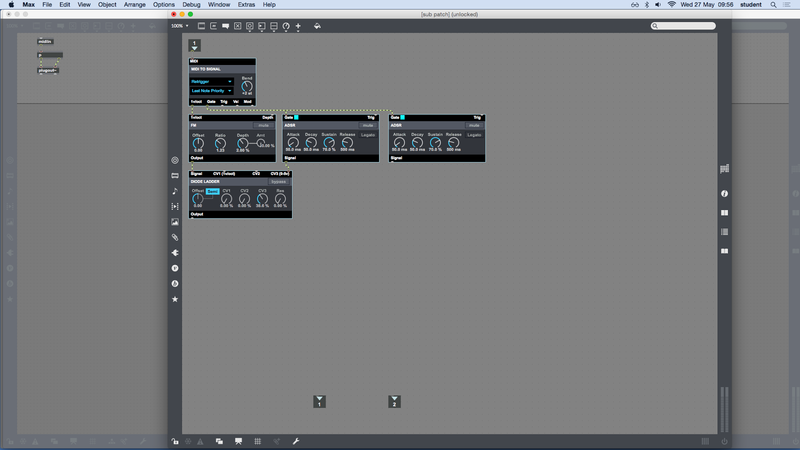 From there, adjust parameters while playing MIDI data into the synth to experiment with setting up a basic FM patch.